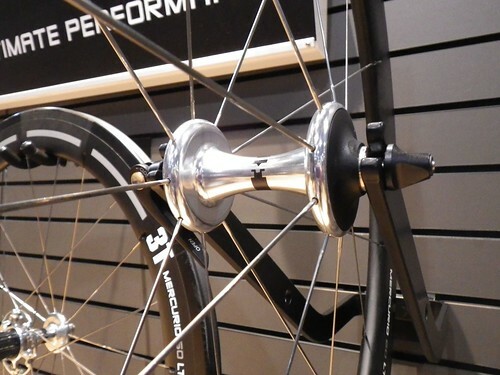 Above is 3T’s new Mercurio carbon aerowheel designed by Richard McAinsh, seen below at last year’s Interbike. The Mercurio was one of the most interesting designs I saw, and I was lucky enough to get the word right from McAinsh. More pictures and story after the jump. There’s been a lot of attention given to the new generation of aero road bikes such as the Specialized Venge, but there are well reasoned arguments and test data that suggest that wheels may have a greater effect on drag reduction. And there’s been a lot of development in the aerodynamics and construction of carbon rims. Hed Cycling has been in the game for a long time now, setting the trend for the fat, toroid shaped rims, while longtime rival Zipp has countered with a even more blunted shape that they refer to as “Firecrest”. In both cases, the aim of the wide rims is to improve drag reduction at greater angles (yaw) to the apparent wind by encouraging the airflow on the leeward surface of the rim to remain in a smooth stream rather than trip over itself and go turbulent swirls (that is, the airflow “stalls”). Ten years ago, a wheel like the Mavic Cosmic Carbone had a rim 58mm deep and 19mm wide. Today’s Hed Stinger6 is 60mm deep and 28mm wide, and Zipp 404 Firecrest tubular is 58mm by 27mm. 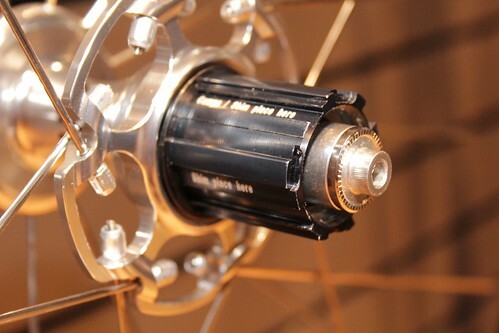 Though Hed and Zipp have similar maximum dimensions for their rims, the rims are distinctly different in shape. Of course, both companies have data supporting their design to have the lowest drag, and I don’t have any reason to doubt either of them. Is that contradictory? Not really. I expect that it’s because of how they test their wheels. You can’t create a scientific test without making some assumptions, i.e. pre-deciding what are the most important criteria of performance. That’s why aero rims have gotten wider; new testing protocol assumes that sidewind performance is much more important than previously valued. Real world performances in actual competition suggest that the newer assumptions are valid, but to what extent? 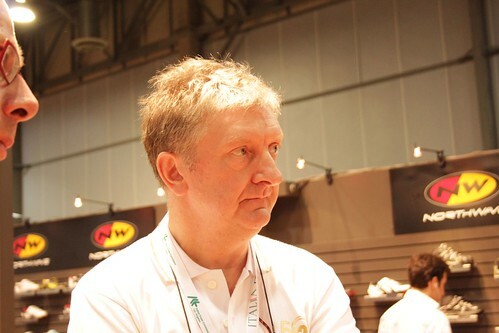 This is what 3T’s head designer, Richard McAinsh asked when he began development of the company’s new Mercurio aero wheels. In the end, the wheel is a bold design move, combining a well-reasoned restraint against blindly following aerodynamic design trends with a virtuoso use of composite structural design. 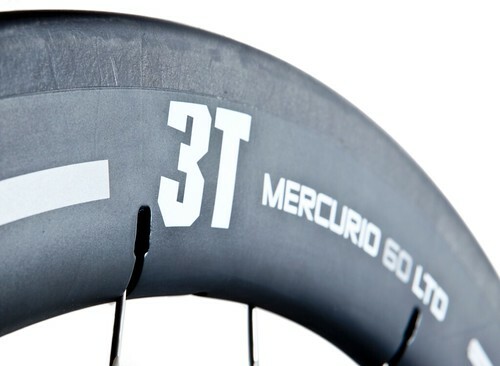 The 3T Mercurio wheel features a subtler toroid shape with a maximum width around 23mm, which seems rather conservative relative to cutting edge of the industry, but as the former head composite designer for Ferrari Formula One, McAinsh’s opinion packs some punch. McAinsh’s performance model for a wheel diverges from that of Hed and others in that it acknowledges the influence of non-zero yaw angles to the wind, but it reasons that because there is a wind speed gradient relative to height above the road surface, yaw angles are not as large as frequently assumed. In other words, the actual wind speed is slower as you get closer to the ground, so true wind’s effect on the apparent wind on the wheel is diminished. This jibes with my experience with sailing rigs on boats; the tops of the sails seeing more wind than sail right above the boom. 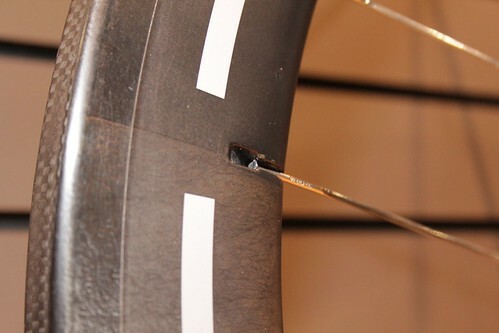 With a slightly narrower width, a profile that matches well with the tire, and a clean and rounded trailing edge, the rim should theoretically perform as well as the fatter toroids in moderate sidewinds, beat them in zero yaw angle or calm air due to smaller cross-sections, and weigh less. If the more complex aerodynamic model of the Mercurio wheel makes for a less dramatic rim profile, the composite structure is daringly innovative. In just about every other carbon rim, holes are drilled into the rim for the spokes, and that just isn’t playing to carbon’s strengths. In contrast, the Mercurio has pockets moulded into the sides of the rim to catch the head of the spoke. 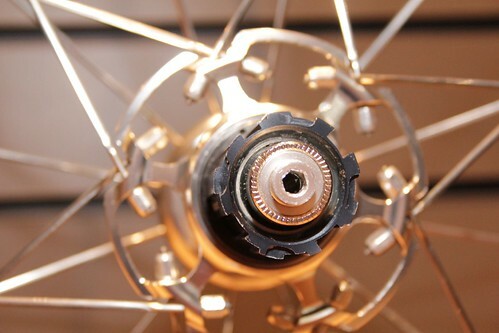 The threaded end of the spoke is tensioned at the hub, in a design that was directly borrowed from the old Cane Creek wheel systems. To be honest, I’m no fan of the Cane Creek hub design because truing from the hub is awkward for most mechanics. At least one doesn’t have to remove the tire to true the wheel (Enve & others), and the 3T-made hub is aesthetically pleasing. One last clever bit is the cassette body that can accept both Shimano/SRAM cassettes as well as Campagnolo cassettes. 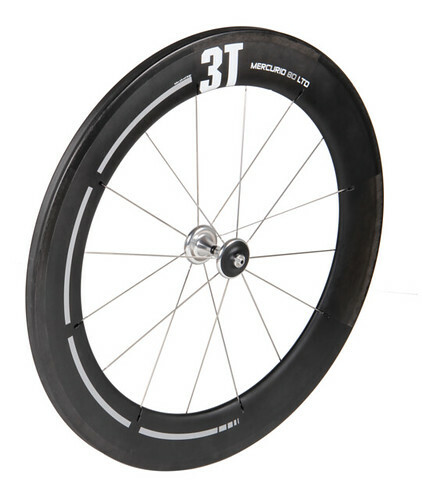 The Mercurio wheels are available in 43, 63, and 80mm deep rims. The $2,400 Mercurio 60 has a claimed weight of 1390gr.